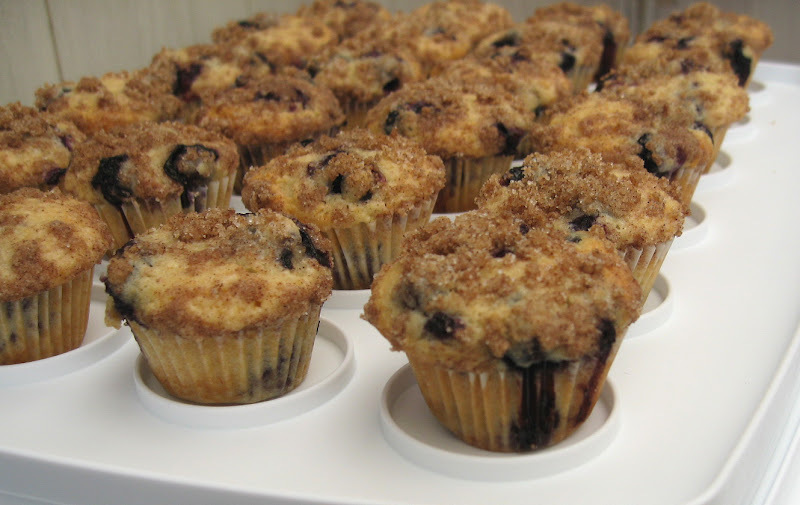 I have baked a lot of blueberry muffins ever since I became interested in baking back in 2000. I always liked them best when they just came out from the oven. They seemed to harden once they got cold. I didn't know how to bake muffins that would stay soft and moist until I came upon a recipe called "To Die For Blueberry Muffins" very recently. "To Die For" is a bit drastic, but the muffins I made with this recipe are the best blueberry muffins I have ever baked. Not only they smell awesome, they look equally impressive. The texture is somewhere between muffin and cupcake, and they stay soft and moist. I have baked them in both jumbo and mini sizes. The minis are perfect for potluck and parties. 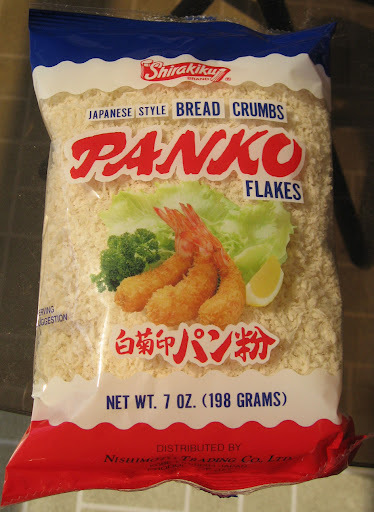 The jumbo ones are good for breakfast. This particular recipe involves making a crumb topping for the muffins. It's a little more work, but the topping makes a huge difference. I followed the recipe pretty closely. I used evaporated milk and margarine (for the topping) only because I don't usually buy milk and happened to be almost out of butter. I bet they would be even better with butter! Also if you follow the recipe, you'll end up with a lot more crumb topping then needed. I made the crumb topping according to the recipe for 18 big muffins and ended up with enough crumb topping for 18 jumbo plus 24 mini muffins and more! I would cut the recipe in half for the crumb topping. Some fat conscience people will scrap off the topping, but don't worry, others will happily eat the topping that's been scrapped off. I am looking forward to picking the apples any day now. 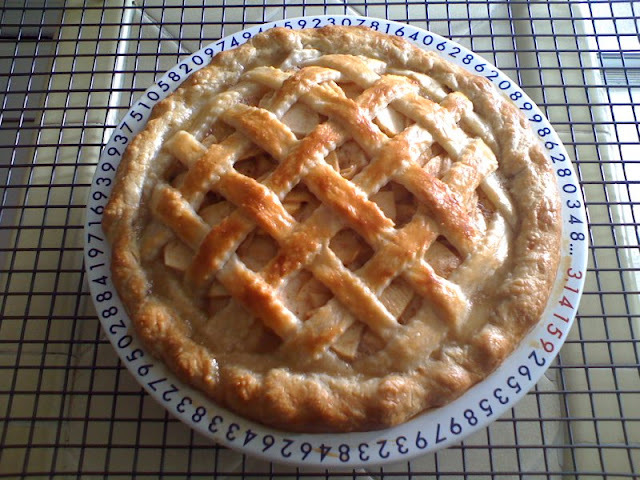 In addition to eating them raw, I enjoy making apple pies from scratch. I also plan on making some cinnamon apple puff pastry - similar to the Curried Beef Puff Pastry but filled with cinnamon apples. Apple blossoms are quite beautiful I think even though cherry blossoms get all the glory. Just 3 months ago the tree was in full bloom. It seems like we are either having a very late summer or not having much of a summer at all this year. It's taking longer for everything to grow. My stevia plants arrived in the mail today. I ordered them from Hirts Gardens through their Amazon account. I first learned of stevia about 3 years ago. I had some exotic tea at this Chinese tea house with decor that reminded me of a kung fu movie tea house. The tea was pleasantly sweet, and I did not add sugar. I asked the waiter what was in the tea that gave its sweetness. He told me it was stevia, a naturally sweet herb. After I got home, I looked up Wikipedia to learn more about it. It's widely used as a sweetener in Japan where it has been available since 1970. Why is it not widely used here when we have a serious obesity problem in our country? Why did the United States ban stevia in the early 1990s unless labeled as a supplement, but in 2008 approved rebaudioside-A extract as a food additive? At the same time, Americans are eating Equal, Sweet'N Low, and Splenda as sugar substitutes. I think all these sugar substitutes taste nasty. They just taste artificial to me. I can never drink a diet soda. Of course I know why a natural sweet herb like stevia is kept away from people. "According to US-based market intelligence provider Information Resources Inc. (IRI), for the 52 weeks ended March 22, 2009, US sales of sugar substitutes were roughly $372m, with sales of Splenda sugar substitutes at about $217m. Sweet'N Low and Equal's sales were $48m and $37m, respectively." See Artificial sweeteners market to change for more information. Regardless of increasing artificial sweeteners sales each year, the obesity problem and its related health problems have only gone up year after year. I like natural sweets whether they are sugar can, stevia leave, or raw honey. I will take sweetener in its most natural form any day. You will not see opening one of those pink, blue, or yellow packets. I love flaky puff pastry. Is anyone out there who doesn't love those delicate, flaky, puffed, crispy, and buttery layers? I recently had some Argentine empanadas from Promo's Parrilla, and they were most excellent. Javier of Promo's Parrilla makes authentic Argentine empanadas, and the buttery empanadas pastry was quite memorable. He wasn't going to give out his grandmother's secret recipe, so I started searching the internet for some clues. Of course, I could always just use a box of Pepperidge Farm pastry sheets as most of recipes suggest. However, what's the challenge and sense of accomplishment in that if I just open a box from the freezer to make the puff pastry? I have heard how time consuming and labor intensive it is to make flaky pastry by hand ever since I started cooking more than 20 years ago, so I never even attempted it. As I Googled for puff pastry, I came upon A Shortcut to Flaky Puff Pastry. A shortcut doesn't sound bad at all. After all, I really don't have an entire day to work on the dough. I followed the instructions on the website, and the pastry turned out quite well. The filling is made of Sand Village Farm onion, ground beef, curry powder, and a little salt. I also brushed on a layer of egg wash right before they go into the oven. I have not yet decided how I want to fold the puff pastry, and I didn't realize they puff up so much once baked. I cut the dough into 4"x 4" squares. Next time I will cut them in 2"x 2" instead. They should also look more uniformed. I also want to make a vegetarian mushroom filling instead. Remember those 700 bees that we captured last semester? We opened their box to check on them today for the first time since we placed them in the bee box along with the cardboard box on May 2, 2010. The top picture is what we saw inside of the box when David finally pried open the lid. The box was filled with honey. Under the bee box lid was attached with the top portion of the beehive and saturated with honey (see picture below). I am getting really bold around the bees. I know that I am supposed to be calm and move gently around the bee hives, but I was so excited to see how much progress these bees have made. They really made a new home for themselves. I was moving back and forth taking pictures and trying to get better angles. As you can see from the pictures, most of us just had our regular clothes on. Some of us were wearing short sleeve shirts and shorts. It was a very hot day. If you are afraid of bees like I was, I can tell you that bees are peaceful creatures. See how we broke their hive and robbed their honey? Nobody got stung today just like May 2 when we brought them to their new home. See Revisiting the Newest Bee Colony for more pictures. Monday nights are school nights for me this summer. I am learning about useful herbs from Master Ken. Tonight Master Ken wanted to do a live demo of decoction, also known as making soup, during the class. He brought in some celery, sweet corn, carrots, herbs and a few loquats from Alemany Farm, where he volunteers on Monday afternoons. Before we started cooking, we got to take a walk through the campus garden to pick more veggies and herbs. I immediately grabbed my basket and ran out there. I love the campus garden! We will never go hungry there. We picked big fat zucchinis, green beans, new potatoes, a couple heads of broccoli, basil, rosemary, rose pedals, garlic, onion, strawberries, etc. My basket was getting really heavy. I left my camera on my desk otherwise I would have taken pictures. While the soup was cooking, Master Ken started making a special blend of pesto. In addition to basil and olive oil, he also added some blueberry juice and loquats. The pesto was naturally neon green and sweet. It wasn't bad at all. Later on he added some salt and perhaps a few other herbs to it. I had some tortilla chips with the sweet pesto. The soup turned out quite well, too. How could it not? Everything was so fresh. The soup tasted great and healthy. Food tastes so much better when you get to pick it from your garden where you have put in the time and sweat. This round "Worms-can" above is my favorite compost bin. I got it in early 2010 from Berkeley Freecycle. It's more sturdy than the rectangular Worm Factory, and the round design has less parts with potentials to break off. The Worm Factory below is the first worm compost system I got from Craigslist's free section. I didn't notice the posting until a week later. I didn't think it was available anymore since it was left on the sidewalk as indicated in the ad. I drove by the address anyway since it's close by. I noticed the trays sitting inside of a locked gate. I emailed the poster, and it turned out it was still available! I was so excited to get the Worm Factory and started a mutually beneficial relationship with the worms. Both Worms-Can and Worm Factory collect compost tea with their bottom trays. Several people in my "Beneficial Beast in the Garden" offered me buckets of red wigglers to start worm composting. I remember watching a TV show years ago about worm composting, and I never thought I would be doing it. I never thought I would be digging in the farm looking for worms and catching them with my hands either. There was something the worms really liked. I think it was an apple. I like to check on my worms periodically. Normally you don't see them when you open the worm compost bin because they prefer darkness. They are either underneath the surface or they quickly dig underneath to hide as soon as you open the lid. As soon as I turn the compost with a trowel, I find clusters of red wigglers all intertwined together. It makes me happy to see big fat worms! I feed the worms vegetable and fruit scraps, old and wilted vegetables from the veggie patches, moldy fruit from the trees, egg shells, tea bags, used coffee grinds, and some weeds. I keep the worm bins under a shady tree so the worms won't die from being overheated. 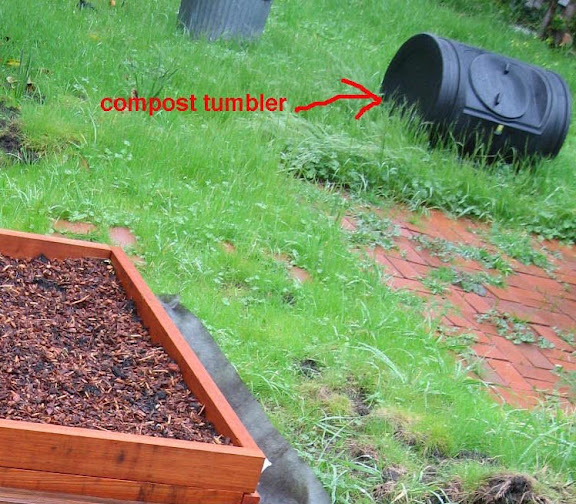 In December 2009, I ordered a compost tumbler over the internet. I filled it with both dry and wet (brown and green) yard clippings. It's July now, and it has not fully turned into compost. 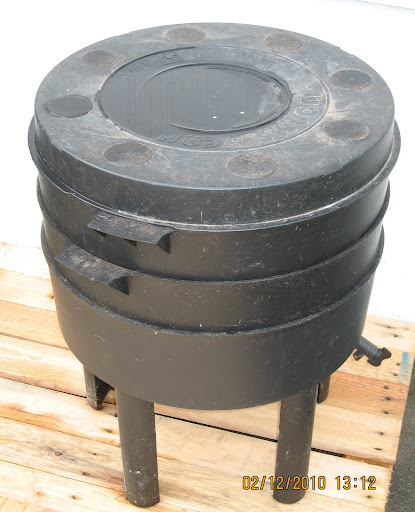 The compost tumbler cost about $100. If you are thinking about composting, I highly recommend the worm method. You can easily make your own worm compost bin or look for giveaways on Craigslist. Some counties even offer worm compost bins to their residents free of charge as I found out that Alameda County was giving away Worm Factories. I always try to start my day earlier than usual on weekends because they are mine to do whatever I want, and I want to get farm work done in the early morning before it gets hot. As I was getting ready to clear out the dry dead snow peas, I noticed how Dusty was running around and up and down in the sun room. He stopped at the door and tried to see what I was doing. I opened the screen door to see if he was going to step out. He was curious and stuck his head out for a second then went back in. Master Ken talked about tools the other day in the class. He showed us all the gadgets he carries on him at all times. I was particularly interested in the little folding saw he had. The longer I have been learning from Master Ken, the more I feel the need to carry my shears with me at all times. Okay, perhaps not when I am sitting in the cubicle. Last night when I walked down the street, I noticed that one of my neighbors has passion fruit vines in their front yard! 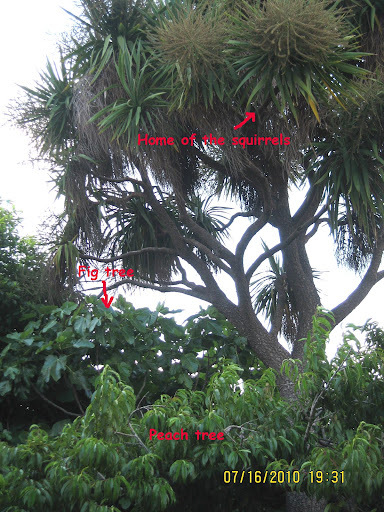 I only noticed them now because I learned from Master Ken's class what passion fruit vines look like. I ran home to get my shears so I could get some cuttings. Master Ken highly recommended Hida Tool & Hardware in Berkeley for high quality garden tools and urban farmer accessories like his mini folding saw. I have seen the shop for years as I drive up and down San Pablo Avenue but never checked it out. I stopped by the shop today. As I was paying for my new accessories, I casually mentioned that Master Ken at Merritt College recommended the shop. I got my 10% Merritt College discount! As soon as you step in the small shop, you will see hand saws of various sizes on the left wall. As I was trying to figure out which one Master Ken carries around with him, a friendly gray kitty greeted me. I had to pet him a bit. At first I picked a bigger saw. Later on I spotted more smaller folding saws on the right side of the entrance. I got one with a 5-inch blade. It comes with a clear carrying case that can be worn on a belt. It's a Silky Pocket Boy with medium teeth. I initially got a pruner holder but had to return it because none of my shears would fit in there. Perhaps I will have to make my own tool belt at some point. This Pocket Boy saw will come in handy when I go mushroom hunting, too. I also got a serrated knife made for removing weeds from small cracks or corners. This one was recommended by the shop keeper. I tried it out, and it seems to work better on certain weeds. Perhaps I just need to figure out the best way to hold the blade. You know how stubborn weeds can be. When you grow your own food, you tend to cook your own food, too. I spend a lot of time on the farm, so it's only natural that I cook frequently. I usually pack my lunch for the day job, and this morning I woke up thinking about gyoza (a.k.a potsticker). "Thinking" is an understatement. I had an urge of having gyoza for lunch and actually got up at 7 A.M. on an office day. I bought a pack of ground beef for making curry beef puff pastries a couple nights ago (that was another craving). I knew that I would have leftover ground beef after the puff pastries, so I got a pack of gyoza wrappers as well. I chopped up a bunch of farm fresh scallions and one store bought king oysters mushroom. They were mixed in with the ground beef along with spices. After all the ingredients were mixed well, I started folding the gyoza together. I figured 15 gyoza would be enough for lunch. For those of you who know me, if you want to learn how to fold gyoza, ask me to do a demo for you. I heated up a few table spoons of oil in a non-stick pan (a well seasoned cast iron pan works, too) and put all the gyoza in there as shown in the picture above. Let them sizzle for a minute or so then pour some water in there and cover the pan. Reduce the heat to low and let the water steam the gyoza. This way you don't need to turn the gyoza to cook them through. When they are fully cooked, you will see the change in color as they become semi-transparent. I used a Pyrex lid, so I could see them while they cooked. 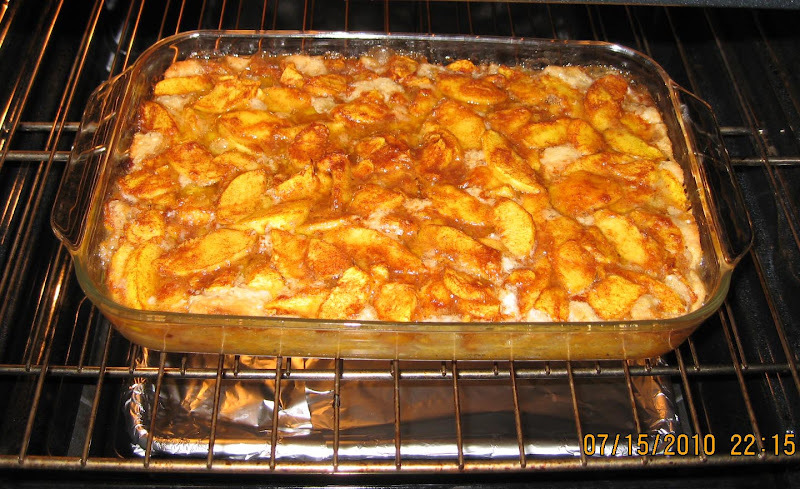 When they are cooked through, lift the lid and let the water fully evaporate. The oil you put in the pan earlier will start to brown the bottom of gyoza and give them a nice golden brown color. I like my gyoza crispy. When I was about to have my 15 pieces of gyoza for lunch, all 3 people I was having lunch with asked me the same question, "Are you going to eat all that?" Well, I was going to try. As a result, I offered each of them a piece to shut them up. I have continuous success growing zucchini for a couple years now. 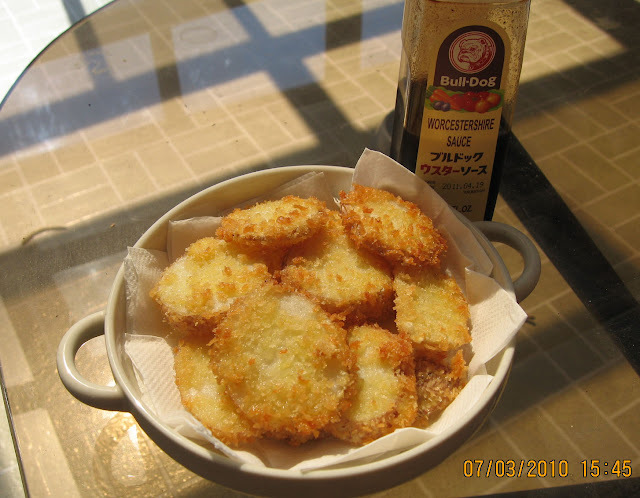 The blossoms are great for deep frying with cheese stuffed inside. If you are going to eat the blossoms, make sure that you pick the male flowers. The picture above shows a female flower with a zucchini on one end (upper flower) and a male flower with just a skinny stem on the end (lower flower). The zucchini I grow are small. I think that's because I am not giving them enough room. I also get blossom end rot frequently. You can see a rotting zucchini in the picture above right underneath the male flower. If I catch those rotting zucchini early enough, I just cut the rotted ends off and eat them. Blossom-end rot is caused by a lack of calcium in the developing fruit. So either the plant is not absorbing enough calcium from the soil or the soil doesn’t have enough calcium in it to start with. The solution is to get a PH soil test kit and test your soil. If it is lacking calcium, the solution would be to add calcium to your soil. If the test shows the soil is okay, then you can increase nutrient uptake to the roots of the plant by mulching and adding compost/organic matter to your soil. I noticed an unexpected visitor during July 4th weekend in one of my strawberry pots. I was surprised to see an inky parasol in July! Members of the mushroom genus Coprinus are called 'inky caps' because the cap turns into a black inky ooze of spores as the mushrooms mature. They usually reach inky stage within a few hours. There are many North American species in this genus (over 200 known species worldwide), including the popular and easy-to-recognize, Shaggy Mane mushroom, Coprinus comatus. By noon the strawberry Inky was falling apart. I was feeling a little melancholy to see the Inky leaving so soon. Back in February they were popping up in one of my 4x4 potato and onion beds every morning. It was always a delight to see those little round fuzzy caps popping up from underneath the mulch. Most of green onions on the farm were grown from store bought onions. Green onions (a.k.a. scallions) you get from grocery stores come with roots. If you save about 2-3 inches from above the roots and stick them in the soil, they will start to grow. You will then have endless supply of green onions. They will flower and each pompom looking flower is actually a cluster of small flowers. Bees love onion flowers. I often wonder what onion blossom honey tastes like. After the flowers dry up, you will see little black specks of seeds in each tiny flower. Each cluster of flowers probably produces nearly 100 seeds depending on the size. I have grown some green onions from seeds. They grew very slowly in compare to just planting the roots from store bought onions. However, you do get more tender green onions if you grow them from seeds. I am collecting various seeds for the next seed exchange gathering in the fall.